I've been longing to acquire a Car Seat Cover for our infant for a daily use. Something his car seat need, has a multi-purposes and convenient, especially during the time that we have to take him in and out of the home in his car seat in the car or when we stroll. Be covered from all those harshest winds, obnoxious bugs, blinding sunlight, harmful germs and bacteria. Not to mention, since I love to be what's in the fashion world, I'd like to obtain one that is trendy yet functional accessory that every Mother admires every time the sees one. I'm indebted that I have a favorable circumstance to critique one of Armful of Love's canopy design. They sent me a Grey Chevron Pattern Printed one in the main to which I distinguish in a unisex color and scheme. The product was shipped to me through the USPS and can be purchased HERE. 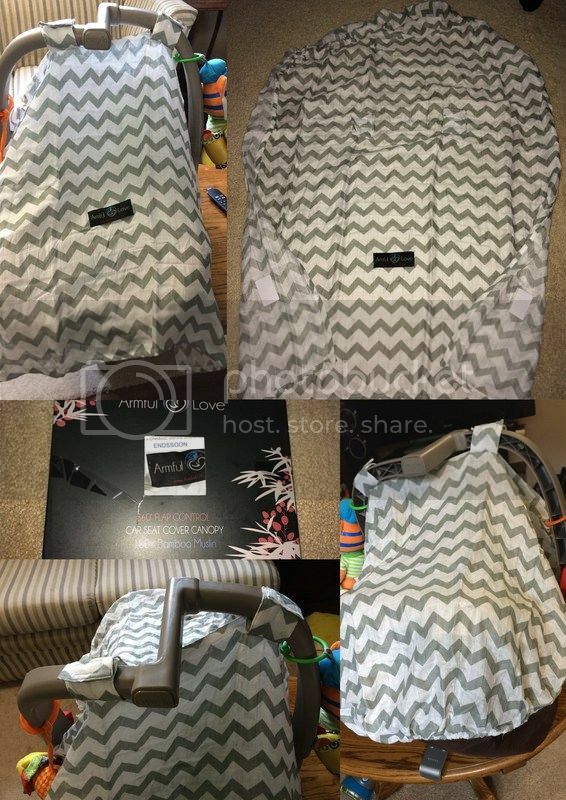 I received the nice 360 degree Flap control car seat cover Canopy. This car seat accessory has a 100% Bamboo Muslin material use. I can't get over to the Grey Chevron Pattern Print in which it looks more popular. I never thought that the cover is breathable, has an Innovative Wind-Proof Designs, and safe until I held the car seat cover with my own hands and felt it. Take note that no matter how gusty it could be outside [which usually happens during Fall Season] the cover is shielded due to the elastic band on the top portion of the cover that holds the fabric, same as the Velcro located on the bottom part of the cover in which you'll slip on the sides of the car seat. They are very simple and quick to place. The Car Seat cover is also very light weight. Very different from what we see, hear until we feel this canopy. We possess with a Z design handle car seat, unlike those straight once, I never thought that the cover would be useful until I put it on and it did still cover the entire car seat just the way I want it.